The Canadian Government has two main types of immigration documents: permits and visas. Permits allow someone to be in Canada and control what they can do (eg. study permits allow long-term study in Canada). Visas are required by citizens of some countries to enter Canada. 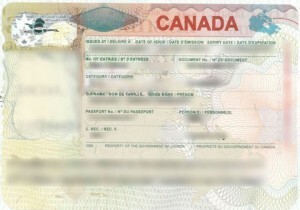 Most people that do not require a visa, require electronic Travel Authorization (eTA) to fly into Canada. Accompanying family members can find information on our Spouses, Partners, and Families page. If your citizenship requires you to have a temporary resident visa (TRV), sometimes known as an entry visa, it must be valid on the date that you enter Canada. It can expire any time after that. Temporary resident visas (TRV)s are about the size of a passport page and placed in the passport by Canadian immigration officials. If you submit a successful application for an initial (first) study permit outside of Canada (and your citizenship requires you to have a Temporary Resident Visa), the visa will be issued with your letter of introduction. It is not necessary to submit a separate application. Therefore, the following information only applies if you already have a study permit but your TRV has expired or if you do not require a study permit (because you will study for no more than 6 months). Apply as far in advance as possible. A TRV application can take from one day to a few months to be processed. The processing times provided through Immigration, Refugees, and Citizenship Canada are regularly updated. It is just an estimation. Apply through the Visa Application Centre (VAC) that serves your country or region of residence. These are private companies contracted by the Canadian government to provide services to visa and permit applicants, including collecting biometric information, secure delivery of applications and passports, and more. They charge fees for their services. They do not make decisions about applications. Your application is likely to be processed through the Canadian Visa Office serving your country or region of residence. you can apply for a new TRV online. Follow our Guide for online application at the beginning of this web page. TRV applicants will automatically be considered for a multiple-entry visa. The application fee for a single TRV is $100 CAN (or local equivalent). The maximum fee for a family’s TRV application is $500. You must follow the payment instructions for the online application system or the Canadian Visa Office that you are applying to. Those required to provide biometric information, must pay a separate biometric fee of $85 CAN (or local equivalent) for an individual and a maximum of $170 for a family. Get Verification of Enrolment (at no cost) from SOLUS [accessible through https://my.queensu.ca]. In case there is an issue with that document, students can visit the Records and Services section of the Office of the University Registrar (found in the lower level of Gordon Hall). If your application is successful, your passport will be returned to you with a valid TRV on one page. You must enter Canada before the expiry date of the visa. Since 2016, citizens of all visa-exempt countries (excluding the United States) require an eTA before boarding a plane to Canada. Since May 1, 2017, citizens of Brazil, Bulgaria, and Romania that have EITHER a) had a Canadian Temporary Resident Visa (TRV) in the past 10 years, OR b) have a valid U.S. non-immigrant visa can fly into Canada with an eTA (they still require a visa for entry into Canada by any other means). Immigration, Refugees, and Citizenship Canada (IRCC) provides a tool to determine whether a TRV or an eTA is required. An eTA costs $7 CAD, and is valid for 5 years or until the expiry of your passport (whichever comes first). Applications are made online and require a valid passport, e-mail address, and credit card. In most cases, an eTA will be issued in minutes. Successful first-time applications for study or work permits processed after August 1, 2015 automatically include an eTA for those whose citizenship requires one. More information about these permits is available on the Studying and Working in Canada pages of our website. Information in addition to what is noted and linked above is available from Immigration, Refugees, and Citizenship Canada (IRCC). Permanent residency offers the right to stay in Canada permanently. Please begin your research with our “After Queen’s” page. If you have further questions after reviewing the information above, drop-in advising is available (without an appointment) from the International Student Advisers at QUIC from Monday to Friday between 11:00 am and 4:00 pm. (available 24 hours a day, 7 days a week) If you have a touch-tone telephone, you can listen to prerecorded information about IRCC programs, and check the status of your application. Monday to Friday, 8 a.m. to 4 p.m. (local time, excluding holidays) Services are available in French and English. For questions about Temporary Resident Visa applications submitted within Canada. Complete address (including the postal code). If the residential address is different from the mailing address, please provide both addresses. Date that the application was submitted, and whether it was submitted online or mailed to a specific office. For case-specific questions about applications being processed at a Canadian visa office outside of Canada. Find the case-specific enquiry link at the page with information about the Canadian Visa Office serving your country or region of residence. There you will also find a generic e-mail address for the office. Choose which option is best for your question. For case-specific questions about applications being processed within Canada. The case-specific enquiry system for applications processed within Canada can be used when processing has taken longer than the currently advertised processing times, or there are important updates to an application.